Preparing a child for first grade involves much more than just pencil and paper. There are many things you can do with your child every day that are not only fun, but will help make the transition to school easy. Before learning to read, every child should be read to. This shows how interesting books can be, and provides the best incentive to learn. I suggest that you choose a good quality book with attractive illustrations. The children’s librarian at your local library will have plenty of suggestions, in addition to those listed here. Sitting with your child, you have an opportunity to model how a book is held and how the pages are turned. To show how books are composed, read each page _ the title page and part of the copyright page with the year the book was made. Also read the dedication page. 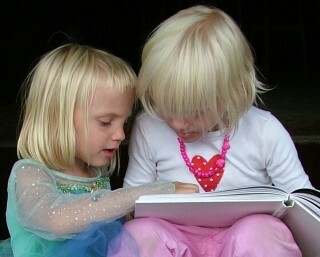 Before reading a page with a picture, show it to the child and ask questions like, “What do you see in this picture?” “What do you think the story is about?” Don’t belabor talking about the pictures, but understand that they are an essential part of the reading process because they show what the words mean. The pictures are there to give the young reader clues to the story and vocabulary words used. This is wonderful opportunity to help advance your child’s oral skills, which are developed before reading skills. Encourage your child to use complete sentences. Be patient so the child has plenty of time to formulate ideas. Be prepared to read and reread the stories. Most children love to hear them over and over again. If they start filling in the words as you go, congratulations. You’re helping them develop memory skills without effort. I like Mother Goose rhymes for three reasons: First, they pass on the tradition of our culture. Secondly, they allow the child to hear the rhythm of our language. Thirdly, Mother Goose rhymes are highly adaptive to dramatization. Try reading the rhyme while the child acts it out. We can encourage a child’s auditory skills by teaching the child some traditional songs such as You Are My Sunshine, Skip To My Lou, She’ll Be Coming Round The Mountain and I’ve Been Working On the Railroad. Like Mother Goose rhymes, these old songs are fun, and pass on our tradition and our culture. Teaching them will help your child feel part of the group later on at school. Children are always excited at school when they hear songs and stories that they learned at home. 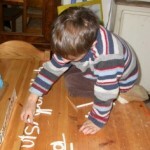 Another helpful activity is letter recognition. Choose a letter, place a printed example where the child can see it, and have the child model it in clay. Help your child roll a rope and shape it into the letter. Do this with both upper and lower case letters, and ask the child, “What’s different?” Talk about the name of the letter. Next find examples of the letter in magazines, newspapers or junk mail. Have your child circle the letter or cut it out. The cut out letters can be pasted onto a chart or in a scrap book. Another helpful activity is rolling clay into ropes, then making the numerals, 0-9. Be sure the child has a model from which to copy. Make groups of clay balls to represent each number. If the child is ready to count, you could have them count forward as well as backward. While looking at the clay numerals you can also ask such questions as, “What number comes between 3 and 5?” Or point to a numeral at random and ask the child to name it. Learning spatial terms can be very helpful for a young child. Use play to teach these terms. Place a small box and a small object on a table. Ask the child to place the object on top of the box. Next, ask the child to give you a sentence telling where the object is placed, i.e. “The _____ is on top of the box”. 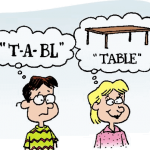 Do the same with other words such as under, in, above, below, behind, front, over, around, out, beside, etc. Children are natural collectors. Using this interest can help them learn early math skills. Collections can include rocks, leaves, pits from fruit, screws or just about anything. These collections allow the child a chance to look for patterns as they sort and group their “finds” into different categories. Children can even help around the house if they do these activities with silverware, money or canned food. As you shop for groceries, point out how foods are grouped in the market and see if they can arrange them in a similar fashion at home. A visual-spatial learner is a student who learns holistically rather than in a step-by-step fashion. Visual imagery plays an important role in the student's learning process.